A few years ago I found a dead baby snapping turtle, maybe two inches across, on the side of a bike path. It wasn’t crushed. It just looked like it had worn itself out trying to get across the vast expanse of pavement to the marsh on the other side. Perhaps it had gotten disoriented and wandered the hot roadway for too long and baked itself. Anyhow, it was a treasure, so I took it home and buried it in a Tupperware filled with desiccating silicon crystals, the kind you use to make dried flowers. Two months later I took it out and voila’! A turtle mummy! It’s the cutest damned thing. But honestly, I would have loved to have found it alive instead, and helped it to safety of the marsh only yards away. Is there anyone in Ontario who hasn’t seen a snapping turtle (Chelydra serpentine) or at least signs of one? That snake-like head rising just above the surface of the water, eyes on top, the better to see you with. The dark grey algae-covered shell gliding over the murky marsh bottom like a submarine mothership. A female, slowly marching across the road in spring in search of a safe place to lay her eggs. The litter of broken shells left by hatchlings, recently emerged from a sandy roadside berm. And, of course, the roadkill from all the unsuccessful overland treks. Everyone in Ontario, it seems, has a snapping turtle story. So, you’d think with all these sightings, with so many travelers and cottagers spotting the creatures in backyard ponds, roadside sand banks, and cottage lakes, there must be plenty of snappers around. But no. 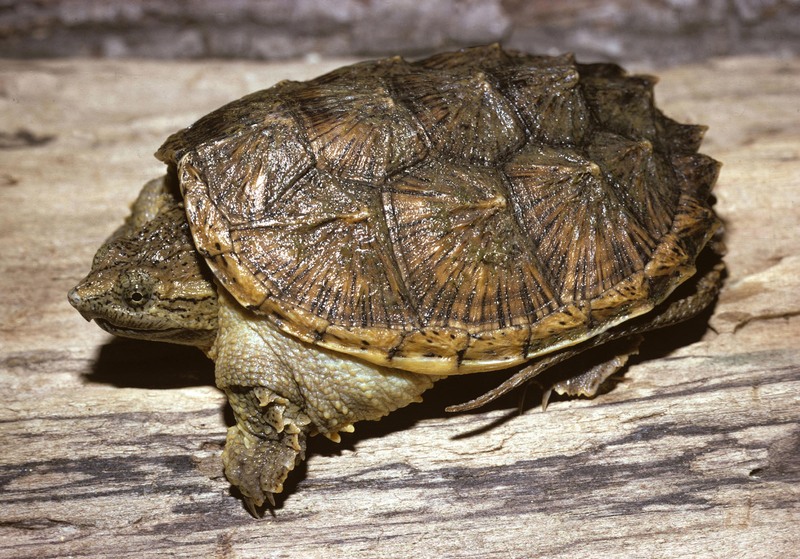 It turns out that this iconic animal (which in my mind, ought to be the Ontario provincial reptile, if such a designation exists) is in peril. Although not yet listed as endangered, the snapping turtle is listed as a species of special concern under Ontario’s Endangered Species Act as well as by the federal Committee on the Status of Endangered Wildlife in Canada (COSEWIC). And this week The David Suzuki Foundation, Ontario Nature and the Kawartha Turtle Trauma Centre released a new report documenting the plight of Ontario’s imperiled snapping turtles. 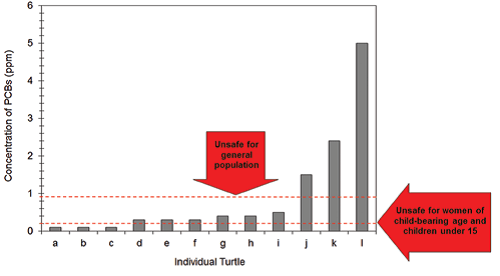 Specific pressures affecting the snapper include loss of wetland habitat (70% of southern Ontario’s wetlands are gone), automobiles (in one study, 75 turtles were killed on one 3.6 km stretch of roadway in one Apr-Oct season. ), and hunting (legal and illegal), all of which are pushing this prehistoric creature, reptiles that have been around for 40 million years, to the brink of extinction. Turtle deaths due to loss of wetlands and automobiles are unfortunate, but accidental, casualties of human expansion. But hunting? With all the talk about preservation of a species, the province allows people to kill these animals on purpose? Yes they do. While you might assume that a species listed under the Endangered Species Act would be protected from the specific hazard of hunters, that’s not true for the snapper. Today the Ontario Ministry of Natural Resources (MNR) permits the hunting of snapping turtles by anyone with a valid Ontario small game or fishing licence, with a limit of killing up to two snapping turtles a day and a possession limit of five turtles. So why do people hunt snappers? To eat, of course. But here’s the thing, the meat taken from these creatures is toxic. The Suzuki report also examined levels of polychlorinated biphenyls (PCBs) and mercury in snapping turtles. Remember, these are top predators and omnivores, so they take in all of the toxins from every plant and animal below them in the food chain and the water that surrounds them. Nobody should be eating these animals. And if you can’t eat them, there is no reason to hunt them, right? Well, there is one more reason. Snapping turtle meat is considered a delicacy in many places and is featured in upscale restaurants and online exotic food stores. It’s a lucrative market for poachers. (Remember, you cannot legally hunt snapping turtles for commercial reasons) Using illegal bait lines or simply hauling turtles out of hibernation, poachers can quickly collect a large number of turtles in a short period of time. So let’s start by getting snappers off the legal hunting list and then law enforcement and concerned citizens will know that anyone in possession of snapping turtles, for any reason, is breaking the law. The David Suzuki Foundation, Ontario Nature and the Kawartha Turtle Trauma Centre Report (DSF Report): Read a summary, media backgrounder, and download the report here. Ohhhhh…snapping turtles. So many memories. My dad used to bring them home – huge ones, with shells the size of trash can lids – from fishing trips wrapped in huge blankets. He’d show them to us and then take them back out and release them. Last year, my sons were late for school because we had to stop along Rt. 10 in New Hamphshire to move a female who had decided to dig her nest and lay her eggs on the side of the road. I got her to bite a stick and Ben picked her up by the shell and we moved her down closer to the pond. Great article, Kim! I had no idea that it was legal to hunt snapping turtles. I agree with you–it shouldn’t be. Oddly, I’ve been going to cottage country (Scugog and Muskoka) for most of my life and have never seen a snapper. Great article. No thanks on eating them. My husband, mother and I seem to always find wayward baby snappers trying to cross the roads around Lake George. We are only too happy to rescue them from certain death by being run over to an very uncertain future in the lake. Is there a person with the ministry of natural resources or other that will remove and relocate a snapping turtle from a trout pond? My neighbor has a turtle who is eating all his fish and doesn’t know what to do about it. I would like to try and get it removed safely and relocated to another habitat.